Conventionally Polyvinyl Chloride (PVC) and Bi-axially Oriented Polyamide, BOPA (commonly known as BON) films have been extensively used in cold formed pharma packaging industry. A typical Alu – Alu blister laminate comprises three layers i.e. 25 micron BOPA/ 60 micron soft aluminium foil / 60 micron PVC. Eliminating BOPA and PVC films in the cold formed Alu- Alu laminate blister pack for pharmaceuticals has for long remained a daunting task for packaging experts. A conventional cold formed pharmaceutical blister back when dumped in the land fill gives away chlorine upon coming in contact with sunlight. This is extremely harmful for the environment. PVC also contains plasticizers with phthalates linked to a host of health disorders that can damage the liver, kidneys, lungs and reproductive system. PVC film leaves high carbon footprint making it further undesirable from the environmental perspective besides exhibiting very low temperature resistance which is yet another shortcoming. BOPA (BON) on the other hand is also fraught with challenges like high moisture absorption to the tune of 8-10% making its processing difficult; leading to de-lamination and impairing the ability of the film to be chemically primed. Keeping these challenges of BOPA and PVC substrates in mind, the team at Films Business of Uflex undertook extensive R&D activities for almost two years to come up with a special polyester film that obviates the problems posed by BON and PVC. The special polyester film is all set to replace the top and bottom substrates of the conventional cold formed Alu – Alu laminate to a whole new structure comprising 36 micron special polyester/ 50 micron soft aluminium foil/ 36 micron special polyester. Polyester is a para-crystalline material which possesses excellent barrier, clarity, printability, and hardness properties. Film forming and orientation of polyester augurs well for the creation of thin profile webs with excellent properties for use in flexible packaging. This speciality film that has been developed by Uflex can be laminated on both sides of the aluminium foil without any problem quite like the laminate comprising BOPA, Aluminium Foil and PVC films. 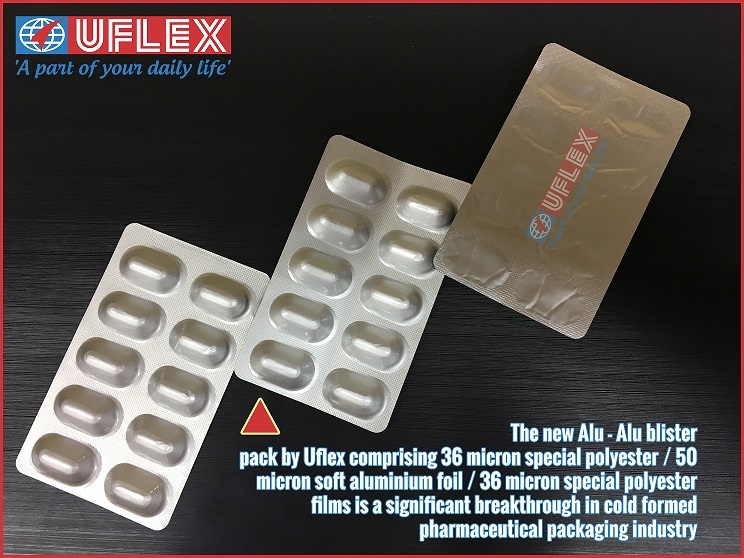 The engineers at Films Business of Uflex have been successfully able to bring metaphase morphology which has made it possible to form the film in Z direction which happens to be a pre-requisite for blister packaging. Commenting about this major breakthrough in the field of pharmaceutical packaging, Dr. Sudhir Naik, Senior General Manager, Corporate Technical Services at Films Business of Uflex said, “Getting better functionalities as compared to the Alu - Alulaminate structure comprising BOPA-Aluminium Foil- PVC, Uflex has come up with a special polyester film that will have significant and substantial benefits for the converters catering to pharmaceutical brands. If we talk about India, BOPA (BON) is imported from countries like China, Korea and Taiwan. More over the convertors are left with no option other than managing varied inventories of BON and PVC films separately. With the introduction of our specialised Polyester film that will now be laminated on both the sides of Aluminium foil, the logistical hassles for convertors will surely go down. The dependency on import of BOPA will also go down as the converting industry gradually switches over to our new specialised polyester film for cold forming the blister packs. This film therefore makes a strong case for import substitution in India. Talking further about the new polyester film Mr. Pramod Sirsamkar, President – Technical & New Product Development (Films), Uflex Limited said, “The moisture absorption of this specialised polyester film is as low as 0.8% working out to almost 92% less than that of Nylon which is a big advantage. Aluminium foil as you know offers negligibly low oxygen and water vapour transmission rates. Such high barrier may not really be required by the drug packed inside. We are therefore also working towards offering high barrier (yet thinner) speciality polyester films as an alternative to aluminium foil that may further lead to the reduction in overall weight of the ensuing laminate. The introduction of specialised polyester film in Alu – Alu blister packaging as a replacement for BON and PVC films has also opened up avenues for us to come up with biodegradable and oxo-degradable variants further minimising the carbon foot prints. We are also working on developing such speciality films using recycled polyester and Green PET that will bolster our commitment towards the environment.”, added Mr. Sirsamkar. Complementing the comments from Films Business, Mr. Amitava Ray, Executive Director and Head of Packaging/Converting Business at Uflex said,“It is incredible that we have been able to replace the existing 25 micron BOPA/ 60 micron soft aluminium foil / 60 micron PVC structure with the new laminate comprising 36 micron special polyester/ 50 microns soft aluminium foil/ 36 micron special polyester films. There is also a yield benefit in the case of the new laminate structure but with no compromise on functionalities whatsoever. This light-weighting of the laminate equates to lesser energy consumption at all the three critical stages of flexible packaging life cycle i.e. manufacturing; transportation and disposal. The reverse printing on the special substrate has further opened up the avenue for enhanced brand visibility and last mile communication possibilities through the body of the pack. Being fully integrated flexible packaging solutions company we also stand in a good stead to offer specialized and technologically advanced anti-counterfeiting features for the new Al- Alu laminate keeping the fake and spurious products at bay. This is all the more important for pharmaceutical products. There is a substantial and growing demand for Alu-Alu blister packaging in India as well as across the globe. With the new Alu- Alu blister laminate structure in place, we at Uflex have been able to engineer a product in India that has way to go in several continents! This also upholds our commitment towards our Government’s flagship scheme, Make in India. We are ready with the product and are working with leading pharmaceutical companies for the commercial rollout. We will be exhibiting this packaging solution along with several value added packaging products for the pharmaceutical industry at ASIA PHARMA EXPO 2017 to be held at Bashundhara Convention City in Dhaka, Bangladesh from 23 to 25 February 2017. We will be in Hall 4-A; Booth no: 4001”, concluded Mr. Ray. Uflex will be present at Booth 4001 in Hall 4-Aat ASIA PHARMA EXPO 2017 to be held at Bashundhara Convention City in Dhaka, Bangladesh from 23 to 25 February 2017.